The Bayswater Omnibus. This oil painting by GW Joy was exhibited at the Royal Academy in 1895 and at the Paris Salon in 1896. 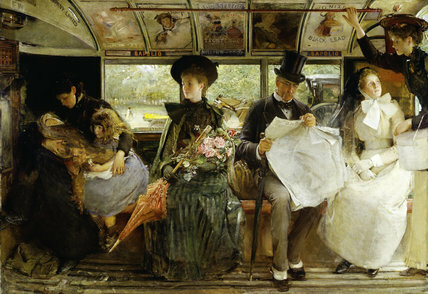 It shows group of passengers (mother with baby and small child, fashionable young woman, a City man, milliner and a nurse) in an omnibus evidently passing Hyde Park or Kensington Gardens. It features a Pear's Soap advertisement and a Hansom cab in is visible in the background.